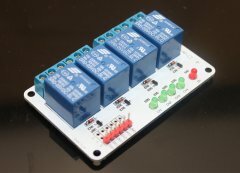 This is a 4 channel relay module. It can be used to control the lighting, electrical and other equipments. The modular design makes it easy to expand with the Arduino board or other MCU board PIC, ARM and MSP430. The Relay output state by a light-emitting diode. Dieser Artikel wurde am Dienstag, 27. November 2012 im Shop aufgenommen.